Through the years I have not kept up with the continuous introduction of new spoons and spinners. I follow the minimalist approach to fly fishing and lure fishing. It has saved me lots of money, allowed me to organize my tackle boxes more intuitively and, most importantly, it has kept me from befuddlement trying to remember when, where and how to effectively fish all the lures that I have crammed into a tackle box. I wasn't surprised to see that my old standbys from the fifties and sixties still reigned supreme in John Merwin's Field and Stream article, "50 Greatest Lures of All Time," published April 2006. When I checked to see if my All-Time Favorite Lure for Mammoth Lakes circa 1959 was even mentioned, I was delighted to find the red and white Daredevle Spinnie ranked in the number two position, just below the Curley Tail Grub. My next favorite lures, Mepps Aglia, Panther Martin, Kastmaster and Little Cleo, were all ranked high. Along with a Super Duper lure, these were the lures that I used exclusively in my youth when I wasn't using a fly rod to dab a red worm in a small crick. Note: Visit my companion web site, Fishing tips 101. Field and Stream published a follow-up article a year later with "50 Best Lures." For the trout recommendations, they listed (in order of preference) a baker's dozen: 1. Wiggle King Flatfish; 2. Rooster Tail; 3. Panther Martin; 4. Mepps Aglia; 5. Norman Deep Tiny "N" crankbait; 6. CountDown Rapala; 7. Yo-Zuri Snap Bean crankbait; 8. Al's Goldfish; 9. Needlefish spoon; 10. Phoebe spoon; 11. Float and Fly trailer; 12. Marabou Micro-Jig; 13. Mister Twister Jig. Everyone has their confidence lures and their secret, unorthodox perversions of angling tradition that they often don't even share with a brother or best friend. I will share my, honest-to-Goodness, fish catching abomination later in the article. Recently I surveyed two tackle shop managers in the eastern Sierras for their recommendations. Both shops have long standing reputations for offering good tackle selection, friendly service and outstanding tips and information. Jeremy Ross of Ernie's Tackle and Ski Shop in June Lake and Jim Reid of Ken's Sporting Goods in Bridgeport echoed some of the recommendations of Field and Stream, as well as suggesting tried-and-proven trout catching techniques for the Sierras. In the survey that I submitted to them, I asked them to rank spoons and lures with four rankings. Number 1 was a top choice. I asked them not to differentiate between which lure was the top lure in their number one choices. Keep in mind that I also included bait in this survey. Both men listed CountDown Rapala and Thomas Buoyants as a number one choice. Both managers recommended inflated nightcrawlers and PowerBait as a number 1 pick. Salmon eggs came in 2 and 3, as did Kastmaster lures, Little Cleo lures, Daredevle lures and float-and-fly combinations. Both Jeremy and Jim ranked the Mepps Aglia and the Rooster Tail as a number four choice. For bait Jeremy Ross recommended PowerBait or Gulp or Rainbow. He also recommended original Rapala lures in silver and rated them as a #2 choice. Other lures that he recommends to his customers are Trout Teasers, Tasmanian Devils and Panther Martins, which I forgot to include on the survey. He noted that June Lake has excellent shore access, and he noted that fly fishers in float tubes and kick-boats do well early in the morning and the evening with Woolly Buggers and Matuka streamers. Jim Reid of Bridgeport recommends trolling from Rainbow Point to the dam with flashers and crawlers, Rapala, or Thomas Buoyants both early and late in the season on Bridgeport Reservoir. He also recommended Worden's Flatfish as a #3 choice. When fishing from the shore or a stationary boat, he recommends CountDown Rapala, Buoyants, and Kastmasters near the dam. He said that the best side of the reservoir for shore anglers was northeast from the dam to about a ¼ mile south. An old adage among lure fisherman is that lures are designed and packaged to attract buyers. Don't believe it for a minute. Most lure companies spend a great deal of money on scientific research. If you fished and fished a lure and never caught a fish and than lost it on a snag, are you going to rush out and replace it? The movement of the spoon or spinner has to be realistic; it has to reflect light, and the color of the lure needs to match a particular color of water, such as brown, green or blue. One simple rule to remember is that if you are fishing at dusk or very low light, fish will see a dark silhouette against a lighter skyline better than if you use a light colored lure. If you are fishing in bright light go white. If you are fishing in the dark go black. Mepps recommends using "silver on bright days; polished brass (gold) blades produce best when it is overcast. Try copper in streams after a heavy rain, or in dark, stained water." Into this equation must be factored the depth and the color of the water and how much current exits. The following lures are recommendations for stream fishing patterns and lake patterns, but first let me review some general information. As I have outlined in my article on fly fishing creeks and again in using baits on creeks, let me reiterate a key factor on catching trout in moving water. Get in the water and wade upstream! 3. It is much easier to cast to a pocket, pool or small riffle from the center of a stream and maintain a slow retrieve. Best of all you are in an ideal position to cast effectively towards either bank. 4. Wade fishing in a stream also allows you to cast directly upstream which creates minimal arm, rod and line movement that might otherwise spook a fish. Trout have great peripheral vision. Often they lie in broken water out of sight, but if they don't see the angler blended into the bank cover, they often see a flash of line or arm or rod movement, which warns them that a predator is near. Even while you are wading in the current, it is paramount to keep your shadow off the water in front of you. I often crouch in the water behind a boulder to make a short cast to a pool above me. 5. In many instances, where there is heavy brush or trees, it is difficult to reach choice water from the bank. If you are wading upstream, you have an easier shot at often over-looked water that bank anglers pass up because they can not penetrate the tangled bank barrier. 6. Finally, once you are in the water, keep moving! Bank anglers typically spend too much time sitting on a comfortable rock or log. Fishing is a game of percentages. How many perfect casts to good holding water can you achieve in an outing? If you have made two or three casts to a pool without eliciting a strike, move on to the next spot. 7. I am always amazed at how I can walk up a stream under the cover of moving water without spooking fish, but when I walk along a meadow bank I spook fish way ahead of me just from the vibration of my footsteps, which is another reason to be out in the current. An exception to casting and wading upstream is if you locate a shallow pool that is difficult to approach upstream. Remember that trout face upstream in current so they are often spooked by a lure working from the downstream position right past them. However, in slower water the trout will cruise in all directions so the approach is not critical. Another exception to wading upstream and casting upstream is when you are on a river or large stream. In this situation you can make an effective downstream cast by quartering the stream. Cast downstream in a quartering angle. In other words, stand facing the opposite bank. Draw an imaginary line from your feet to the opposing bank. You now have half the stream above you and half the stream below you. As you face the bank, the stream flow is coming from your left down stream past your right side. Now, divide the stream below you in half. This quarter demarcation is your target angle for the opposing bank. Cast as close to the bank as possible. If a trout is on the far bank, he will see the lure coming at him broadside and "swimming" out and away from the bank, as the current sweeps the lure out towards the faster water. Sometimes if you plant it right in front of the trout, your cast will trigger a reaction take. Often times they will follow the streamer as it drifts downstream and begins to sweep out into the deeper water. They will hit the lure just as it swings out from the bank and slows down. 8. If you walk up to a pool, target the tail-out first. Trout will often drift back to the tail-out and hide under broken water or behind small rocks waiting for food to be pushed up from the bottom of the pool into a zone of compressed water. Approach the tail-out quietly and with a low profile. Make your cast land softly. The next target is the center of the pool. Allow your lure to flutter down to the bottom of the pool, and don't be surprised if you get a take on the decent. Just as bass anglers use a spinnerbait sometimes in a jigging motion off the bottom, good spinner anglers will jig up the spinner from the bottom once or twice before retrieving the lure back towards them. The next pool target is to place the lure or spinner above the riffle or small waterfall that feeds the pool. Trout will often lie in wait for bugs and insects to drop from the plunging waters into the pool. 10. If you snag your lure on an underwater object, reach down and retrieve it. After all, you are already wading. Snagging a lure is another reason to use a single hook when fishing a creek or a stream. Often you can retrieve the lure by simply pushing the eyelet of the rod tip right down on the lure and shaking it. For best results when fishing a stream, both for hook-ups and less snagging, use a single hook on a spoon or spinner, and bend down the barb for easy release. The Thomas Buoyant lures work well in small streams, unlike the heavier Kastmasters that sink too rapidly. Use a Thomas Buoyant in a red/gold combination or a blue/silver combination in a 1/6 oz. or a ¼ oz. You want a slower retrieve with an occasional twitch. 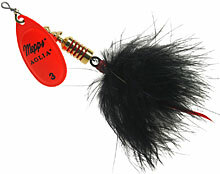 I would also recommend the Mepps Aglia #2 or a Mepps Black Fury #2. Field and Stream recommend Al's Goldfish for heavy, fast water or a Phoebe spoon for slower retrieves on a shallow stream. Generally stick with 1/16 ounce lure for small creeks and 1/8 and ¼ ounce for larger streams and lakes. Or Back to the Future of Fly Fishing. I am like Rip Van Winkle. I have been asleep for far too many years regarding new fishing techniques and the resurrection of old methods. After retiring as a teacher in Montana, I headed to the Modesto area of California to finish out my last few years as an educator. I went with the clear goal of buying recreational toys and boats before I actually retired. When I realized that my trout fishing opportunities required extensive driving, I took up bass fishing. Living in Ripon, I was just a few blocks from the Stanislaus River. I soon discovered what great fun it was catching smallmouth bass while floating in a kick-boat. I used my fly rod and small Gitzits or tube worms. When I got back to Montana for a visit, I excitedly told a local fly shop owner my great discovery. He went to the book shelf and pulled down two books that he recommended that I buy. OK, so I didn't re-discover or invent anything! My success with lead-head jigs, curly tail grubs and tube worms on both trout and bass and delivered with a fly rod has been an outstanding journey. Hey, sometimes the casts are not very pretty when I am slinging heavy tube baits on the end of my fly rod, but the results have been greatly rewarding. Don't hesitate in using curly tail grubs, white mini-jigs, marabou jigs or tiny Rooster Tail lures on creeks and streams regardless if they are delivered with a fly rod or a spinning rod. Small marabou jigs in white and red are my first choice. All of the above can be purchased. I have come to the close of this article, and it is time to reveal my honest-to-goodness trout catching abomination. A few years back I landed a 7-pound rainbow in Klamath Lake using a fly rod and a 1-inch crankbait. My soft-plastic confidence bait for bass is a tube bait. (I prefer the original Gitzits.) I was heading back to Montana, and I began wondering how they would work on a Brown trout that had never seen a crawdad. It was early summer and I was fishing a canyon fork of one of western Montana's famous rivers. The salmon fly hatch was over, but a few golden stoneflies were still whirling up the canyon. Because the water was too deep and fast to wade, I crawled down the embankment to a tail-out of a large pool. I cast upstream without success. My stimulator drifted below me as I surveyed how I was going to approach the main pool. Just as I was about to lift my fly, I saw a dark shadow rise and then silently retreat when he saw my presence. It was a really big fish. I had been made so I retreated to the shore and had lunch and began wondering what I should present this fish sub-surface. Munching on my sandwich, I remember that I had packed a number of tube worms in my vest. I had been optimistic when I packed them. They were two to three inches long! Nonetheless, I changed to a stout leader and put on a speckled, brown tube worm and marveled at the long tentacles that so effectively work on bass. Would it work here I thought? I crouched back to the water's edge and made a perfect drift through the dark crevice three times without success. Just downstream was another dark crevice about four to five feet deep. I lobbed out the lead-head jig hook with the Gitzit and saw a flash of silver boil up from the dark. If he had headed downstream through the fast riffle, I would never have landed him. Instead this big Bull trout buck pushed up into the pool. When I landed him, he measured 25 inches. I fished the Gitzit in varying sizes and colors ranging from tan to brown to green. On Rock Creek I landed many Brown trout ranging in size from 12 to 17 inches; on the Bitterroot River I landed only a few rainbows, but on Idaho's Lochsa River, I had outstanding fishing catching many 16 to 18-inch cutthroats. The only difficulty that I encountered was that the smaller fish in the seven to ten inch range would bite the tail, and I could not catch them. Sure I could have added a stinger hook, but I was having too much fun catching larger fish. I swore I wouldn't reveal this secret, but according to my Google analytics, readers seldom read more than a page and a half of any article on my web site. If you have got this far, give a Gitzit a try. This summer I plan on packing Berkley PowerBait dough in the tube and try some different colors on the rainbows in the Bitterroot River. For more fishing tips and techniques, visit my companion site, fishingtips101.com. This page contains a single entry by David Archer published on April 30, 2008 9:42 AM. Bait Fishing was the previous entry in this blog. Fly Fishing Tips and Techniques is the next entry in this blog.